A copper(II) and iron(III) co-modified titanium dioxide nano material was prepared by a simple sol–gel process using titanium(IV) isopropoxide plus copper(II) and iron(III) nitrates as raw materials. The as-prepared nanocomposites were characterized by X-ray diffraction (XRD), diffuse reflectance spectroscopy and photoluminescence spectra. The XRD results showed that the undoped TiO2 nanoparticles mainly include anatase phase while the Cu, Fe-codoped TiO2 nanoparticles showed a mixture of anatase phase with a small fraction of rutile phase displaying higher activity than the pure anatase phase. Optical characterization showed that the codoping with copper(II) and iron(III) resulted in a red shift of adsorption and lower recombination probability between electrons and holes, which were associated with high photocatalytic activity of the Cu, Fe-codoped TiO2 nanoparticles under visible light (λ > 400 nm). The photocatalytic activity of the samples was tested by aqueous methyl orange degradation. 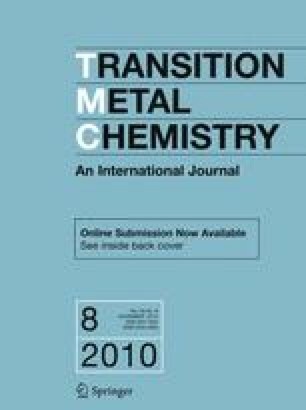 The capability of the codoped catalyst was much higher than that of the pure TiO2 catalyst under visible irradiation. A mechanism is proposed in order to account for the enhanced catalytic activity. This work was supported by the Fundamental Research Funds for the Central Universities and Huazhong Agricultural University Scientific & Technological Self-innovation Foundation (2009QC016).